There are only few days left before the start of the European Veterans Championships in Bremen (from 27th May to 1st June). 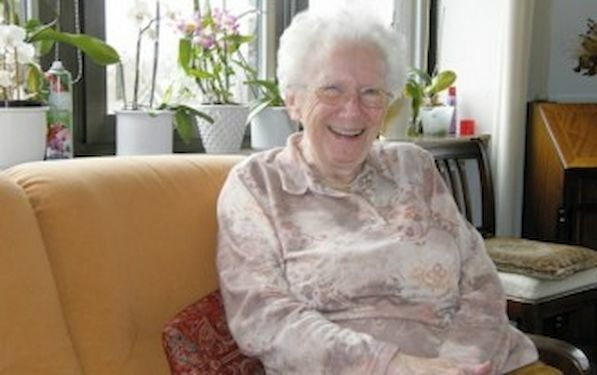 Everything is set for the great gathering and we can tell the same about the oldest participant Inge-Brigitte HERRMANN. Both of them did not practice for this victory. “We only meet at international events, that´s why our only practice is warming up before our first match.” That proved to be sufficient anyway. In the final, the pair beat the oldest participant, Australian Dorothy De LOW, who was almost 100 years old then. “For a long time she was regarded the oldest active player, but meanwhile it´s me who is the oldest,” says Inge-Brigitte HERRMANN. Apart from her passion for the small celluloid ball, there is something else which these three have in common: They started their table tennis career rather late in life. With Inge-Brigitte HERRMANN it started only 16 years ago on the Baltic Sea. “Together with 5 residents and a male nurse of the Old People´s Home where I live, I was staying on the island of Fehmarn. After lunch, while the others were taking a nap, I discovered a TT table in front of a restaurant and asked my nurse if he would like to play with me.” When he said “Yes” she bought two rackets and some balls without further ado and a match started right away”. “I enjoyed that so much that, on returning, I immediately looked for a club.” She chose “FT Preetz”, where the now 92-year-old still practices regularly. She also likes to take on younger players who might well be her grand- and great grandchildren. She first entered the international stage in 2002 for the World Veterans Championships (WVC) in Lucerne (Switzerland) where 2,700 players from 63 countries were fighting for the medals. She has been keenly interested in international competitions – no matter if EVC or WVC. “I am first of all looking forward to meeting old friends and talking to them”, says the old lady who is so fond of travelling. As far as possible, she likes to add on a week of holidays in order to get to know culture and people in the organizing country. What has impressed her most so far is the “very good organization and the wonderful Opening Ceremony” of the 2010 WVC in China. “I have never seen something that beautiful”, she says and you feel that in her thoughts she is reviewing the ceremony once again. After winning the doubles in Hohhot (China), she came in third 2 years later in Stockholm – again with her partner, Ursula BIHL, who is only about half a year younger. After the EVC in Bremen, there will be another long journey on the agenda for the German participants in the World Championships – the destination being New Zealand. Perhaps our player will book her flight there directly via the internet – for Inge-Brigitte HERRMANN is not only familiar with the PC, but well-versed with the World Wide Web, too.